A horse can kick for many reasons; there are flies biting its legs or belly, he or she might have colic, or when they are playing with other horses. These are normal kicks and they are usually not meant to hurt anyone or anything. However, kicking can be classified as a problem if it happens when you are riding, handling, or driving him. This usually indicates that the horse feels the need to defend itself but that it is occurring when the horse does not like something. 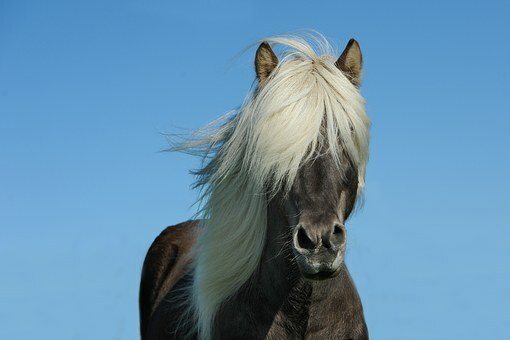 A horse can kick up or sideways with one leg, often called “cow-kicking.” Sometimes they will kick backward with one leg, and if it connects with a person it will connect at their leg level. They can kick the highest, at stomach, chest or head level on an adult person, when they engage both hind legs together. Some horses develop a habit or vice of kicking the wall when in a stall, and over time this can damage their legs and the stall walls. As a horse owner, rider, trainer or stable owner, it is extremely important to identify when and how the horse’s kicking propensity is a problem and address it. Kicking with the hind legs is dangerous, so a horse with the propensity to kick at a handler or other horses during work, handling or while riding needs to be corrected. For some tips, please read on! Even if a horse does not appear to have a propensity to kick, one should always be cautious and aware of those hind legs when near one. Some horses rarely kick, but that does not mean they never will. I know of a farrier who had finished trimming a 3 year old and he was standing in the cross ties seeming quite calm. However when she passed by him a few feet away to gather her equipment, he nailed her lower leg with a well-placed kick and the result was surgery, pins, and a long convalescence. Some half-schooled horses may not like it when someone is forcing them to do something they don’t like, and they will lash out in some way to show their displeasure. Some people believe if a horse kicks with one hind leg, that it is better to be either quite close to the hind quarters where the kick would be more of a push, or out of range for the length of the kick to connect. There is some truth to this, yet it is not an infallible theory, as a horse can move suddenly and put you in ideal connection distance, and some can kick straight out with both hind legs at a standstill. The ideal connection distance; that is, at which the impact of the blow of the hoof can do the most damage is perhaps 2 ½ – 3 ½ feet from the hind quarters. Some of the most dangerous situations are when a horse is being pushed forward with a sorting stick or a whip when they go into a pasture, or when learning lessons on the lunge line. If the horse does not understand what is being asked of it and is confused, or is used to running and playing on the lunge line, it can get angry at the person who is trying to make it behave, and kick out. Also, when in the pasture with several horses, a handler can get kicked by a horse that is trying to push another horse around; in other words, the person gets in between the horse kicking and the horse being kicked at. Sometimes a horse will give a warning by tensing its body, put its ears back, lower or raise its head suddenly before they kick, and sometimes not. I worked with a rank stallion for several months who gave no warning when he practiced his propensity to deftly cow kick or side-kick. He would do it frequently, hard, with bulls-eye accuracy, and at any time. A horse like this is perhaps not worth having around, but I mention it because it shows what some horses are capable of. The best way to prevent serious accidents is to study and learn your horse’s body language. Most horses will show signs of distress in the form of fright or anger before they kick and it is important to learn what those warning signs are. They may be playing. By studying your horse, you can detect the kicking before it happens, and you can identify the triggers. If it is something that terrifies your horse, you might need to introduce your horse to that specific thing and desensitize him. For example, if he kicks when he gets saddled, you will need to do it slower and incrementally. Habitual kickers are not to be trifled with by a novice owner. We therefore strongly recommend hiring a professional trainer to work on the problem. They can work closely with you to ensure that you and your horse are kept safe during the entire process. Many horse owners will take a horse to a trainer and not fully disclose the horse’s behaviors and vices, and this can be dangerous to the trainer and the horse. So be sure to fully disclose the horse’s behavior issues, so the trainer can decide if it is something he or she wants to work with or recommend another trainer for the job. If you go online, you will find many theories on how to train a horse to stop kicking. Some actually make some “horse sense,” but should never be applied by the average horse owner. Depending upon the horse, a trainer may decide to cautiously apply kicking chains for ten to 20 sessions. These are short chains that are strapped to hind pastern between the fetlock and the top of the hoof. The idea behind the kicking chain is that when a horse kicks, the chain will hit its own legs and it will learn to stop kicking to prevent being painfully hit with the chain. In other words, the horse is training itself not to kick and the trainer is not involved in continuously triggering the kicking and then reprimanding the horse for doing it. This and some other methods need to be applied with great caution as if the horse panics, it may continue to hurt itself more as it tries to run from the continuous pain. The horse could end up seriously injured, or it could have a traumatic experience that will require 100 hours of work to repair and gain the horse’s trust again in people. It would be good to discuss with the trainer what his or her first, second and third plans are to correcting the problem, to make sure you know what is going to happen and can decide it the methods are OK with your idea of good horsemanship. If you are in need of high quality horse insurance, please trust in the professionals at Ark Agency! To learn about our options, please give us a call at (320) 243-7250 or (800) 328-9984.